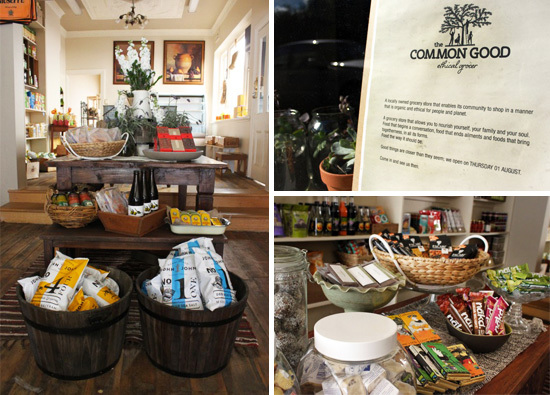 For The Common Good – Hawthorn’s New Ethical Grocer Opens Today! And, just like that, the seed of a life-changing idea was sown. Over 18 months, this idea was given oxygen and fed with love, just like the wholesome organic produce that will be on offer to local Hawthorn residents, come 9am today. For that's when The Common Good Ethical Grocer will throw open its (reclaimed) doors. Located next to a Laundromat on the flourishing Church Street strip in Hawthorn, The Common Good will be the first grocer of its type to service the local Hawthorn and Richmond community and, from my sneak peek, I think they will be more than pleasantly surprised. Step inside the doors and you will find a warm, inviting, earthy cornucopia, with a faultless edit of fresh, organic, fair trade and ethical produce, plus home, baby, and personal supplies. The focus is on local (some items—such as organic pasta—are nigh on impossible to find locally) and, above all, ethical products. While most products and produce are organic, not all are certified; according to Meneka, some producers have no interest in promoting their produce as 'organic', as in their minds 'organic' just means 'real food', the way it used to be grown back when we were kids. What's certain is that you can be 100% confident that every brand and supplier on offer engages in ethical practices. Meneka has spent months painstakingly researching the roots of every company (tracing them back to the parent company, and the parent company's parent company, and so on). It's a labour of love for the former high flier, whose family has followed a healthy, organic lifestyle for as long as she can remember. It was after taking voluntary redundancy from a lucrative and respectable career in education that the penny dropped for Meneka and she realised it was time to put her money where her mouth is. So, while she's taking quite the leap of faith and is palpably nervous about her undertaking, she is also extremely excited to see the outcome. We're quietly confident The Common Good will resonate with locals. Firstly, for the beautiful products and produce—including Eco Store cleaning products, Labooko chocolate, Jonesy's milk, meat from Bertie's Butchers (Swan St), Nature's Child Bottom Balm, and daily bread from another Hawthorn institution, Knead Bakers. And secondly, for the shopping experience itself. The furniture and fit out is soothingly organic and earthy looking—think lots of recycled timber, plywood boxes, and hessian accents, and all items are second hand, salvaged, or repurposed. Keep an eye out for the gorgeous front bench, made from reclaimed timber (there's part of a fence and a ship in there, for starters). A tip: that's where they hide the chocolate. The Common Good Ethical Grocer opens today, Thursday 1st August.